Spread Trading System for Excel spread returns are typically non-correlated with other investment and trading strategies, making the model an excellent addition to an overall asset management strategy. The System uses three proven technical indicators - exponential moving averages, Percentage Price Oscillator (PPO), and Donchian Channels, to filter and capture situations where spread movement (and hence risk-adjusted profits) are likely to be greatest. Also presented are three real-world spread strategies, including Swiss Franc - Japanese Yen futures spreads, Nasdaq Composite - S&P 500 E-Mini spreads, and 10-Year vs. 5-Year U.S. Treasury Note spreads. 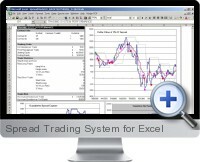 The Spread Trading System for Excel is optimized for use with daily or hourly data, but can be used on virtually any time interval. Data can be imported into the model with a DDE data link available from most market data providers. Instructions are shown on how to build a data 'hub' with a DDE link, or run the model with free .csv data files available from Yahoo! Finance or another source. A complete PDF Guide is provided along with a step-by-step Online Course so you can choose how to learn in the most comfortable way. Also included is a complete back testing model - simply import historical data and see statistical and graphical results for your chosen spread strategy. 30 days of online access to download the materials and learn how to build and use your new Spread Trading Model. Calculate Buy/Sell signals on multiple spread pairs within seconds.